Even if federal unemployment insurance expires at the end of the year, it will be replaced by an even more generous assistance program for people leaving their jobs. Unemployment insurance is jointly administered and financed by federal and state governments, offering funds to “covered” people who lost their jobs and have as yet been unable to find and start a new one. The cash assistance comes weekly, with states paying benefits of about $300 a week for 26 weeks or until the person starts a new job, whichever comes first. Normally, the assistance stops after 26 weeks, even if the beneficiary has yet to find a job. But during recessions the federal government’s temporary “extended” and “emergency” unemployment compensation programs pick up benefits after the state benefits are exhausted. During the recent recession, the federal government paid benefits for up to 73 additional weeks, making the total benefit duration 99 weeks. The temporary federal programs have expiration dates, but Congress has routinely extended them, at least through 2012. A couple of the federal programs fully expired that year, so in 2013 the unemployed could get benefits for no longer than 73 weeks. The last remaining federal program, known as Emergency Unemployment Compensation, is set to fully expire at the end of this year. Congress has extended its final expiration date several times in the past – most recently as part of the fiscal cliff deal – but there is no guarantee that Congress will continue its extensions. If the emergency program continues while the new health care assistance comes on line, the incentives of workers and employers to create and retain jobs will take a big hit. The solid line in the chart below shows my estimates of the average marginal tax rate on worker’s income, accounting for the fact that earning income on a job results in both additional taxes and withheld federal benefits. The higher the tax rate, the less is the incentive to work. 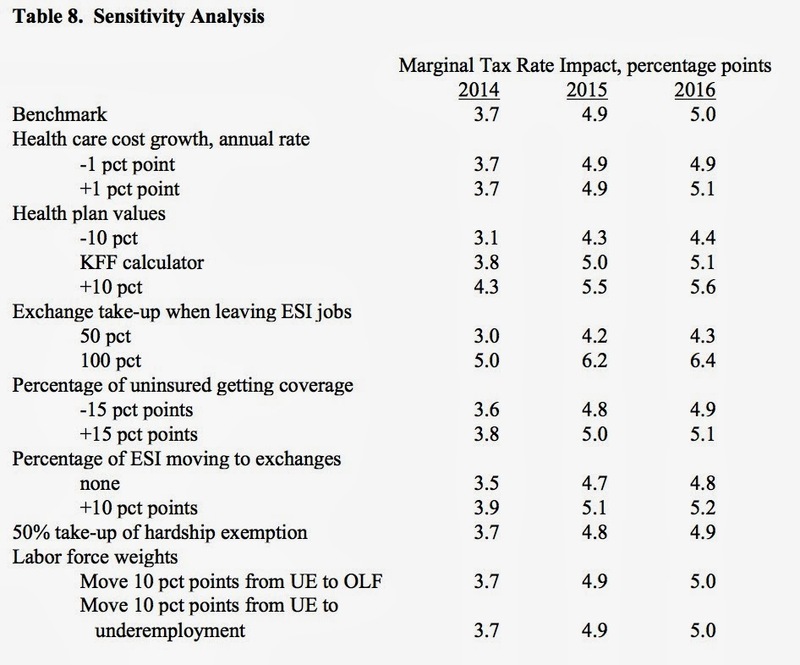 Casey B. Mulligan’s estimates of the impact of emergency unemployment compensation ending in December 2013. 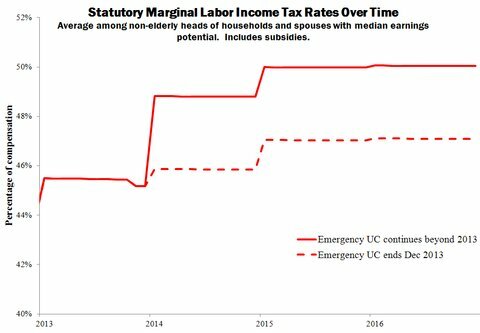 The dashed line shows the marginal tax rate if the emergency program really does expire at the end of the year. Tax rates will increase in January, but much less than they would without the expiration, because the assistance lost from the emergency program will be offset by the health assistance coming online. The federal unemployment benefits at risk of expiration are economically more important than the already-expired programs, because it is less common for unemployment to last more than 73 weeks (when the expired programs kicked in) than it is to last 26. Unemployment benefits from any program help people who desperately need it, but they also keep the labor market depressed by permitting people to remain unemployed longer and making layoffs more common. The remaining emergency program is the most important and thereby does the most to help people and the most to keep the labor market depressed. Even if the emergency program is allowed to expire on Jan. 1, it will ‘be replaced by an even larger program — the Affordable Care Act — assisting the unemployed and others, including premium subsidies for health insurance. Most people have jobs that provide health insurance and will be ineligible for premium subsidies for as long as they work. But as soon as they are fired, quit, retire or otherwise leave the payroll, they will be eligible for monthly assistance to pay for their health insurance premiums and out-of-pocket expenses. For households between 100 and 400 percent of the poverty line – that’s about half of households – the new assistance will average about $110 a week, tax free (unlike unemployment benefits, which are taxable). Moreover, the premium assistance is not limited to 26 weeks; it can last for decades. Regardless of how you evaluate the relative costs and benefits of the emergency program, now is the time for Emergency Unemployment Compensation to expire to make way for new assistance programs. Earlier I wrote about 20+ million people who will lose employer health insurance coverage, even though that coverage was "adequate" under the standards of the Affordable Care Act. The federal government estimated that millions of people (see 75 CFR 34553) participate in employer health plans that would, sometime between Jan 1, 2012 and Jan 1, 2014, have to begin to comply with ACA regulations in terms of services covered (among other things). Actually the time window extends to late 2014 because of the early renewal option. Most of those plans will adjust to comply. But many will be canceled because canceling a plan is consistent with the law even while keeping an inadequate plan is not. The dynamics of the cancellations will be interesting. Due to healthcare.gov's currently bad reputation, I expect that a significant group of employers will comply in the short run and cancel in future years when the prospect of cancellation is less traumatic for their employees. However, that approach doesn't solve the problem of financing the extra benefits in the interim ... employees will pay for that. The extra health insurance premiums are one of the many ironies ... these employees will be paying more because of a law that was supposed to save them money. Fundamental changes in economic performance since the John F. Kennedy presidency help explain why economic policy debates are so polarized these days. In its 34 months, the Kennedy administration embraced a range of interesting federal economic policies. Kennedy proposed permanently cutting personal and corporate income tax rates to promote economic growth, and his cuts became law. During his administration, the maximum duration of unemployment benefits was temporarily extended only 13 weeks, less than in any other recession since then. He expanded the federal space program. He wanted a strong peacetime military and was willing to use it to stand up to communism. His Department of Justice, led by his brother Robert F. Kennedy, was tough on labor unions. President Kennedy pushed for national health reform, although he did not see any legislation passed during his term. As a candidate and then president, Kennedy was initially cautious on civil rights issues, but ultimately worked to put together a civil-rights bill that became the Civil Rights Act of 1964. From today’s perspective, Kennedy looks like a hybrid of a Democrat and a Republican, and as America remembers his assassination in November 1963, journalists and scholars continue to debate whether Kennedy was a liberal. In my view, Kennedy was entirely a Democrat, but that’s less visible today because Democrats and Republicans, and their respective economists, were a lot less different than they are now, especially on matters of microeconomics. Kennedy was advised by James Tobin of Yale, a Nobel laureate who advised other Democratic presidents, too. Tobin thought public programs had gone seriously awry whenever program participants kept less than a third of what they earned on a job, rather than losing it to extra taxes or withdrawn benefits. Friedman thought that people should keep at least half of their earnings after taking into account taxes or lost benefits. Yet in modern times, Friedman and Tobin appear to be quibbling, because now we have millions of citizens who keep a quarter of what they make, or less, in net earnings beyond the benefits they forgo, yet few Democrats are concerned that federal antipoverty programs might be counterproductive. People who lack the capacity to earn a decent living need to be helped, but they will not be helped by minimum wage laws, trade union wage pressures or other devices which seek to compel employers to pay them more than their work is worth. The more likely outcome of such regulations is that the intended beneficiaries are not employed at all. (Unlike Friedman, Tobin did subsequently support a minimum-wage increase, because he thought better antipoverty tools would not be used). These days, Democrats push for higher minimum wages, without any apparent concern that poor people might have more trouble finding work. My point is not that Democrats are more wrong about economics that they used to be, but that, regardless of who is right or wrong, the gaps between Democrats and Republicans in economic reasoning are greater now than they used to be. The economy is different now than it was in the 1960s, especially in that the incomes of the poor have not kept up with national incomes. When the poor are prevented from working by minimum wages or high marginal tax rates, a lesser fraction of national income is lost than in Kennedy’s era, when the poor could produce a more significant piece of the national economic pie. So proponents of big social programs have less reason to be cautious about program expansions. As long as the American economy produces such a wide range of labor market outcomes, we may never see a president, who, like Kennedy, has such wide-ranging economic policies. If households respond to -- what I understand is -- a steep marriage penalty embedded in the subsidy formulae by postponing marriage or even by divorcing, would not this further broaden the effect of the Act in the labor market. In the limit, if every household sought subsidies under such an "income splitting" basis, would not more households qualify, and would not more households be influenced over a larger range of the income curve than even your study assumed? And thus would not the impact on the labor market be even larger [than calculated here]? It depends, even though I agree that the ACA includes a steep marriage tax as well as its steep taxes on labor income. My labor income MTR estimates are based on, among other things, estimates (from the CBO and others) of the number of people participating in the ACA exchanges. Your email provides a good reason to suspect that exchange participation will ultimately exceed the estimates. There are other reasons too. Table 8 in my paper shows what would happen if one increased the exchange participation estimates -- see esp. the "exchange take-up" and "percentage of ESI moving to exchanges" rows. But if the exchange participation estimates are accurate (maybe other factors offset the one you mentioned), then my headline estimates (Table 1) are fine even though the ACA reduces the incidence of marriage. Students of health reform can be informed and entertained by revisiting a book by the health reform champion John E. McDonough. As a member of the Massachusetts House of Representatives from 1985 to 1997, Mr. McDonough had worked for state health reform well before the now famous Romneycare health reform of 2006. During that time he also earned a doctorate in public health. Like many other former legislators, he wrote a book about his experiences and relationships in office. “Experiencing Politics” (published 13 years ago) organizes his stories around social science models of the political process, including the principal-agent model and punctuated equilibrium theory. The models are known by fancy phrases in the academic literature, but Mr. McDonough quickly brings them down to earth with explanations that are nontechnical and addressed to the general public. His stories are engaging and bring the models alive, even to social scientists who have seen the models on paper, yet may be dubious that they have much practical value. Mr. McDonough is not trained as an economist, but usually shows good economic instincts in the book (though he does not mention that per-employee penalties and minimum wages might reduce employment among low-skill workers). Of particular interest today are his Chapters 6 and 7 on Massachusetts health legislation between 1988 and 1997. Mr. McDonough describes how the state’s previous system of hospital rate regulation had been put in place for the purpose of controlling medical spending and how he believes it might have worked for a time. Mr. McDonough describes how Gov. Michael Dukakis’s 1988 law sought to achieve universal coverage in Massachusetts with a legislative package that included a $1,680 penalty (per employee, per year) on employers who did not provide health coverage to their employees. Adjusted for inflation, that would be like proposing a $2,863 penalty in 2006, when Romneycare was passed with a mere $295 employer mandate. The Dukakis package passed narrowly, and to gain legislative approval the final law delayed the employer mandate’s implementation by four years. Does that sound familiar? The national Affordable Care Act was passed in 2010, with an employer mandate to begin in 2014. Mr. McDonough describes how those four years gave Massachusetts employers time to organize their opposition. Moreover, as 1992 approached, the Massachusetts labor market was weak. Arguably both of these things happened nationally between 2010 and 2013. Mr. McDonough had no reply to alleviate that concern. With a few months to go until the originally scheduled implementation, Massachusetts lawmakers decided to delay the Dukakis employer mandate for three years. It would be delayed two more times and then, in exchange for business community support for a coverage expansion for children, ultimately repealed. On the national level, while Congress was not consulted, with six months to go before the originally scheduled implementation, the Obama administration delayed its employer mandate one year. Although today Mr. McDonough notes the differences rather than the parallels between the Dukakis law and the Affordable Care Act, proponents of the national employer mandate should be worried that it may be approaching the end of its political life. Under the traditional rules for setting food stamp/SNAP benefits, monthly benefits would have increased $25.48 between October 2008 and the present, except for the small fraction of beneficiaries who receive the minimum benefit. In early 2009, the ARRA deviated from those rules by legislating an immediate $46.53 increase. That extra increase expired, putting the program back on its traditional path for benefits (but not eligibility -- that's another story). Of course, putting a program back on its traditional path is known in Washington as a cruel cut. The average amount of the cut, accounting for beneficiaries who receive the program minimum benefit, is $20.36 per month. That's about 1/2 of one percent of the employee compensation of the median non-elderly household head or spouse when they are working (and thereby not getting SNAP benefits). Almost half of the reductions in labor among such person result in SNAP participation, which is why putting SNAP benefits back on their traditional path increases the reward to work by about 1/4th of one percent of compensation. The overall reward to work is about half of compensation, so the new SNAP benefits increase the reward to work itself by about 1/2 of one percent. By itself, the change would increase aggregate hours worked by somewhere in the range of (0.2,0.4) of one percent. That change would be partly realized as additional employment and another part as additional hours. E.g, at the very high end the additional nationwide employment addition would be 500,000. However, this increase in the reward to work is small when compared to the reduced reward to work that came in January 2013 with the expiration of the payroll tax cut, and tiny when compared to the reward to work that is coming January 2014 from the ACA. There's been a lot of news about people losing their individual coverage as a consequence of the ACA. But the bigger news coming will be people losing group coverage through their employer. The ACA pays for much of the health costs of people (under 400 percent of the federal poverty line, which is about half of America) who will get insurance through the ACA's exchanges, but ONLY if their employer (or family member's employer) is not offering them affordable coverage. It's like paying employees to work somewhere that does not offer coverage. or keep it to help their higher income employees keep their employer coverage (and the tax advantages that go with it) and to avoid the ACA's employer mandate penalty. Competitive markets create compensating differentials to eliminate such dilemmas, but let's ignore the economics for today. Put early retirees on the exchanges. Former employees do not have to be offered the same coverage as current employees (the offer of coverage might not even be that relevant because I don't think that the ACA premium tax credits obligate people to accept coverage from a former employer). Early retirees many times have little or no wages after they retire, which can help keep their income below 400% FPL. Earlier retirees are older than most of the workforce, so the subsidy they'd get is large compared to other families with the same income. As of 2011, there were about 2 million early retirees on their former employer's plan and below 400% FPL. More would adjust the timing of their income to get below 400% FPL if they were paid to do so, as they will be next year. Including their dependents, here alone we get roughly 3 million people who could lose employer coverage this way. Implement waiting periods. New hires do not have to be offered coverage right away. It has to be offered within 90 days plus any other eligibility hurdles the employer has (e.g., complete a training program). New hires tend to be lower income people, plus the eligibility hurdles do not have to be uniform by occupation, so in this way employers can have people who are both on the payroll and getting subsidies on the exchanges, yet nonetheless no employer penalty accrues and higher income people can be covered by the employer from day one. At any point in time, JOLTS says that 12+ million people have been hired in the last 90 days. Their propensity to have employer coverage is probably lower than the average worker (a significant majority of employees can get coverage fromt their employer), but still there easily could be 3 million workers here, plus another 3 million dependents, at a point in time during which the ACA is fully operational, who would have been covered by the employer if it weren't for the ACA. Require employees -- or even invite them at their option -- to work part time without employer coverage rather than working full time with it. In many cases, employees can make more working part-time. In other cases, they would make just a little less, while working a lot less. 3 million workers is a conservative estimate of how many people will be moved in this way from jobs with coverage to jobs without coverage. Add 2 or 3 million dependents to get 5+ million people moved off of employer coverage this way. A combination of the part-time and waiting-period options is to declare a new employee as "variable time," so that he has to be employed through the end of the calendar year before it is determined whether he is a full-time employee and thereby eligible for employer coverage. Adjust the affordability of coverage. Require employees to pay most of the premium (with pretax dollars) for employer coverage and compensate them with additional salary. This approach will free the low-income employees to receive exchange subsidies, although for large employers it will generate a $3,000 penalty for each such employee-year. Burkhauser and coauthors estimate that a couple million workers, plus dependents, would lose affordable coverage that way (they would still have coverage, but it would not be affordable by the ACA's definition). Unemployed people who use the exchanges rather than COBRA. More than a million unemployed workers are on their former employers health plan and have incomes below 400% of the federal povertly line. People who could use COBRA are still eligible for exchange subsidies. Including dependents, that's about 2 million people who could move from employer coverage to exchange plans, although technically they wouldn't be "losing" their coverage. As far as I can tell, the CBO has not considered all of these adjustments, let alone considered the additional economic adjustments I left out here, yet even they admit that 8-9 million people at a point in time will not have any employer coverage as a consequence of a fully-implemented ACA. I am still working on my own estimate, but the real number has to be in the 20+ million range, plus 2 million or so people who would have chosen to stay on an employer plan through COBRA. Of course, the American taxpayer - regardless of whether he has employer coverage -- will pay for these group coverage loses that were promised to not occur. Moreover, this is not an issue of the adequacy of the group coverage that's lost (although there are millions of separate and additional instances where group coverage will be lost because it is supposedly inadequate), it simply that the ACA induces market participants to tolerate coverage loses in order to, at taxpayer expense, reduce the monetary loses they experience as a consequence of the law. The above model was used to simulate the employment consequences of Romneycare. They find -18,310 jobs, which was 0.6% of Massachusetts employment. BHI also looked at health spending and its components before and after Romneycare. 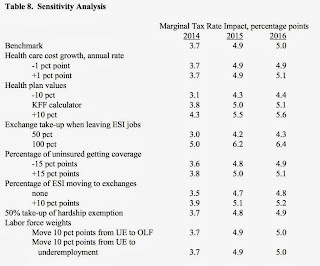 I found that Romneycare increased the Massachusetts marginal tax rate on labor by an average of 0.4 percent points (of total compensation). From my perspective, I'd expect the Romneycare employment impact to be somewhat smaller than the 0.6% cited above: perhaps 0.2 or 0.3%. Given that Obamacare increases national average marginal tax rates by about 5 percentage points (about 12 times more than Romneycare did in MA), trying to extrapolate the Massachusetts experience to the ACA -- as many ACA advocates do -- is bold exercise in extrapolation. But if you absolutely had to extrapolate that way, I'd multiply the Massachusetts results by a factor of something like 12: the ACA's employment impact would be in the -2 to -4 percent range. Multiplication by twelve is sensitive to all kinds of second order errors like rounding errors and I don't recommend it. We have MUCH better ways of forecasting the ACA's consequences. Stay tuned for those. The insurance-market death spiral makes sense in theory, but economists do not really know if, and how often, it is a practical consideration in real-world health insurance markets. Adverse selection refers to a failure of buyers and sellers to transact because one or the other has additional information about the quality or cost of the product to be traded. A classic example from the 2001 Nobel laureate George Akerlof is the market for quality used automobiles, which in theory cannot exist, because buyers of used cars demand a heavy discount because of the likelihood that a used car they might buy will be defective. In theory, nobody sells a quality used car, because it would have to be priced like a lemon. The used car market is, in theory, caught in a kind of self-fulfilling prophecy in which only defective cars are traded in the marketplace and are priced accordingly. The same phenomenon has been used to describe the health insurance market. In theory, absent government intervention, only sick people will buy health insurance, which means that insurers have to charge a lot for the insurance, which means that healthy customers will not buy insurance. This is the supposed “death spiral” for health insurance markets. The solution to this purported problem is to force everyone – especially the healthy – to buy health insurance. That starts a domino effect of other problems, including the unfortunate side effects of the redistribution, such as discouraging employers from creating and employees from accepting full-time jobs, which authors of the Affordable Care Act found to be necessary in order for everyone to be able to comply with the mandate to buy insurance. I agree with the 2001 Nobel committee, which explained that the adverse selection idea is “a simple but profound and universal idea, with numerous implications and widespread applications.” Still, we don’t really know if the side effects of proposed market interventions are more tolerable than the disease itself. The used automobile market is a good example. A prudent car buyer should be aware that defective cars are out there. Nonetheless, the market for used cars did not experience a death spiral and today is active and vibrant. Without any government mandate that the owners of quality used cars sell them, the marketplace has devised a number of practices, such as cars leased from the manufacturer, manufacturer warranties and fleet resales, that help buyers expect quality used cars and thereby prevent the death spiral. Economic theory predicts that all consumers buy actuarially fair insurance – that is, insurance in which each buyer expects to receive as much as he pays – so the mere fact that many people do not have health insurance (especially healthy people, who do not buy because it is too expensive) would seem to prove that the health insurance market is failing. But the fact is that health insurance companies, like just about any business, have significant capital and labor overhead costs. Insurance premium revenue is needed to pay those costs. Under such conditions, the average consumer must expect to receive less than he pays. Many healthy people may thereby be uninsured for a good reason: the overhead costs are too much to justify whatever feeling of safety that insurance might give them. The market might be selecting participants in a productive way. Forcing the insured to buy insurance may be a waste of society’s resources by adding to the already significant overhead costs. Without proof that adverse selection outweighs other kinds of selection in health insurance, the death spiral may not be a serious threat, and government actions to prevent it may be unnecessary.